Vanilla Sugar (or vanillezucker in German) is a staple baking ingredient found in most German recipes for sweet treats like cakes and cookies. For instance, vanilla sugar is an integral ingredient in vanillekipferl, one of the most traditional German Christmas cookies. Very often, vanilla sugar is used as a flavored sweetener in the baked good’s batter or dough, but it can also be used as a final touch sprinkled on the tops of those fresh out of the oven cakes, pies, and of course, cookies. Vanilla sugar is also a great addition to homemade frostings and whipped cream. Others use it to sprinkle onto fresh fruit or add to coffee. Dr. Oetker is the most common pre-packaged vanilla sugar brand available on the US market. The sugar product is called vanillin zucker, which is a variation on vanilla sugar that uses vanillin instead of whole vanilla beans or vanilla bean seeds. Vanillin is the primary substance of natural vanilla bean extract, and it is cheaper than vanilla beans. 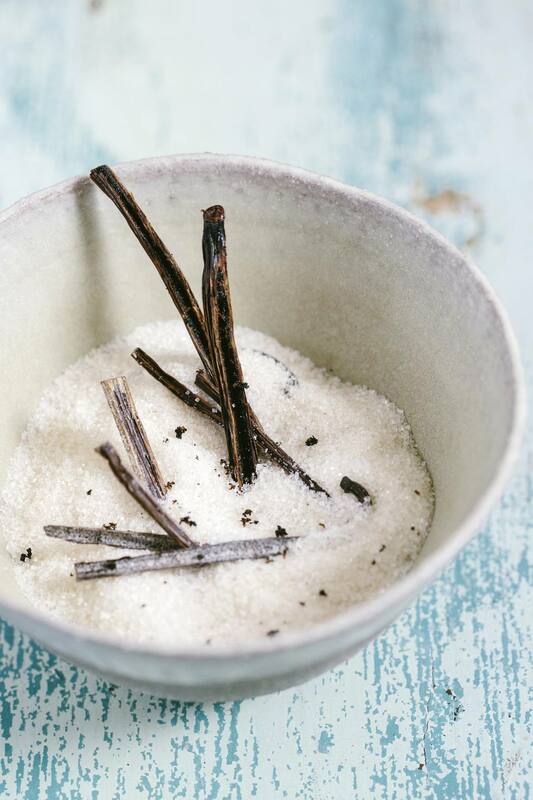 While pre-packaged vanilla sugar can be a convenience, many home cooks insist that homemade vanilla sugar has a better aroma and flavor than the commercially produced counterparts. Luckily, homemade vanilla sugar is super simple to make! Transfer sugar in the new container. Slice the vanilla bean lengthwise and place it in the jar with the sugar. Push the vanilla bean down into the sugar for the greatest distribution of flavor. Place the lid on tightly and leave the jar in a cool place for several weeks. Shake the jar every few days to help distribute the natural flavors evenly. Once ready to use, continue to store the sugar with the split vanilla bean. Most home cooks agree that it takes about 2 to 3 weeks for the natural vanilla flavor to infuse into the sugar completely. If you need vanilla sugar before that 2- to 3-week mark, see the recommended substitutions below. If kept dry in an airtight container, your homemade vanilla sugar has an extremely long shelf life as does the vanilla bean used to flavor it. You can always have vanilla sugar on hand if as you use it, you refill to the container with more sugar occasionally. The vanilla bean will continue to add flavor to the newly added sugar as long as it is still fragrant. Use 1 tablespoon of your homemade vanilla sugar for every packet called for in the recipe. If you can’t wait for your vanilla sugar to be ready to use, you can use 1 teaspoon vanilla extract in your recipe’s batter, note that it does impart a small hint of color. If the vanilla sugar is sprinkled on top of the baked goods, then use regular, granulated sugar.